In this study, Teresa L. Ebert makes a spirited, pioneering case for a new cultural critique committed to the struggles for human freedom and global equality. Demonstrating the implosion of the linguistic turn that isolates culture from historical processes, The Task of Cultural Critique maps the contours of an emerging materialist critique that contributes toward a critical social and cultural consciousness. Through groundbreaking analyses of cultural texts, Ebert questions the contemporary Derridian dogma that asserts "the future belongs to ghosts." Events-to-come are not spectral, she contends, but the material outcome of global class struggles. Not "hauntology" but history produces cultural practices and their conflictive representations--from sexuality, war, and consumption to democracy, torture, globalization, and absolute otherness. With close readings of texts from Proust and Balzac to "Chick Lit," from Lukács, de Man, Deleuze, and Marx to Derrida, Žižek, Butler, Kollontai, and Agamben, the book opens up new directions for cultural critique today. 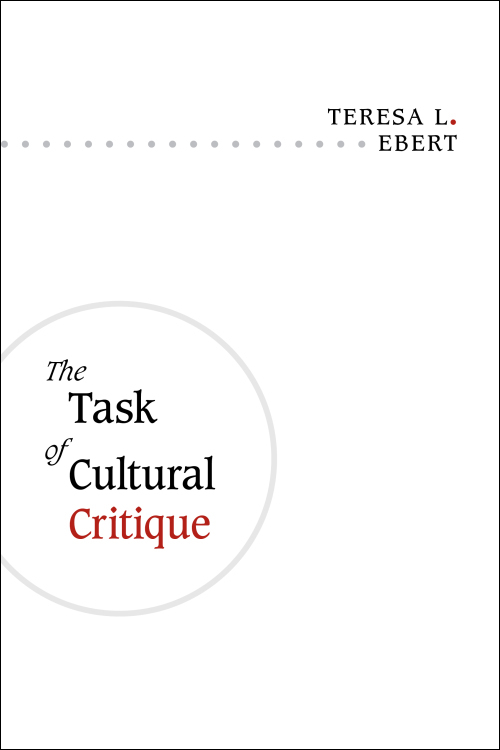 Teresa L. Ebert is a professor of cultural theory at the University at Albany, State University of New York. Her works include Class in Culture and Ludic Feminism and After: Postmodernism, Desire, and Labor in Late Capitalism.